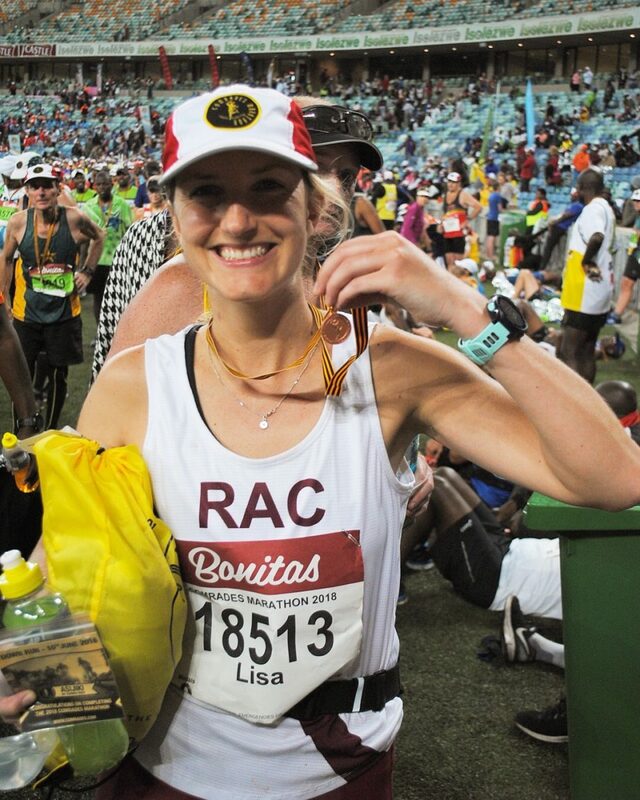 Physiotherapist, Lisa Posnett, ran 90.18km for the Comrades ultra-marathon, from Pietermaritzburg to Durban, South Africa. The night before Comrades I laid out all my running gear, attached my number to my vest, packed my running belt with all my food (cereal bar, oat bar, salted pretzels, salted rice cake, S-caps), filled up my bottle with electrolyte drink with extra tablets packed in my running belt. Then I packed the other essentials Vaseline, tissues and of course Imodium. After a good-sized bowl of pasta, we headed to bed. 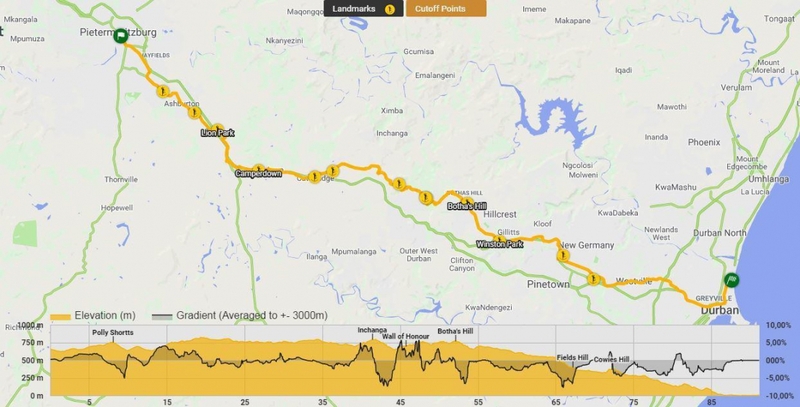 We woke up at 2 am (after about 5 – 6hrs of on/​off nervous sleep), had porridge for ​‘breakfast’ and left at 3 am to make our way to the start in Durban. The temperature was cold so I wore some old tracksuit bottoms and a jumper which I could throw away at the start. 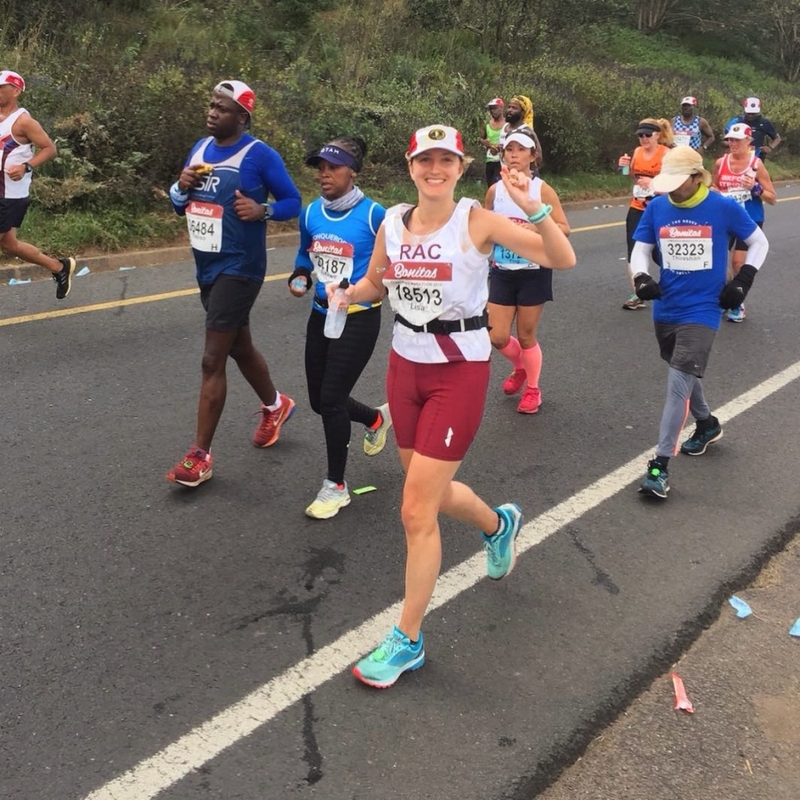 I ran for Rand Athletic Club in their maroon coloured kit, and knowing the temperature could reach 26 degrees I wore the famous Comrades cap that we picked up at the expo. We got there at about 4 am, dropped off our bags (cue a mad dash around because we couldn’t find it) and made our way to the starting pens. My starting pen was G, but my mum was further back in H and I didn’t want to run without her. So we dropped back to pen H, but then suddenly the barriers dropped and there was a mad dash to get as close to the front as possible. There were crowds of runners as far as I could see. Over 21000 standing in the dark and singing the national anthem was incredible, and we sang along with tears running down our faces. 9 tough months of training for this. Then the cockerel sounded, the gun went off and the race began at 5.30am. It took us about 7.5mins to cross the starting line which was quicker than I had predicted. There was a lot of run/​walk avoiding the crowds and the odd bit of clothing and bottle in the dark. I soon got into my stride and the time started ticking down. I had heard about the terrible hills, but at this point, because it was so dark I couldn’t see the hills and so they didn’t bother me. At about 6.30am the sun started to come up and the views were just incredible. Now I don’t really know where I was. I tried to study the route before but couldn’t remember anything I had learnt. Prior to the race I had broken Comrades down into 7 little runs (a very useful tip in an ultra!). This was 15.67km, 14.71km, 14km, 13,35km, 11.26km, 12.45km and finished off with an 8.8km run. I planned how long it would take me to run each section and times I had to reach each checkpoint and wrote it down on a piece of paper which I put in my running belt. I hit the first checkpoint bang on time, one down, 6 to go. And so I kept running, swallowing an S-cap every hour (I’m pretty sure this saved my life and got me through Comrades) and slowly munching on a cereal bar. I soon got sick of the taste of my electrolyte drink so poured it out and stuck with water. We were given water sachets at the drink stations so I would drink one at the water stations and put the second in my bottle. I did this at every single water station, making sure I kept my hydration up. ‘Comrades is a long distance, you can’t be serious the whole time. You need to enjoy your race.’ – 2017 Winner, Bongmusa Mthembu. I hit the second checkpoint very slightly ahead of my schedule, 2 down… 5 more little runs to go. Then the very very long and steep climb up to the halfway point. This wasn’t a hill it was a mountain. I felt like even my car would struggle to get up this. So we ran a tree, walked a tree, ran a tree, walked a tree. This was the first time we saw our support crew and a huge boost. I didn’t need any food top-ups because I hadn’t really eaten much so a quick hello but we kept moving. Then the dreaded stomach issues kicked in at about 45km, and I dropped back a bit from the rest of my group. I battled pretty hard to catch up, then another pit stop and I dropped back again and I realised I was now behind the 12hour marker. I pushed on again, catching up with the 12hour marker and ran with them for a while. These guys were amazing and sang and chanted the whole way, a great atmosphere. It was at that point I turned around and couldn’t see my mum. She had dropped back and I had no idea how she was getting on. But you can’t stop at Comrades if you stop then you can’t get moving so I carried on running with the 12hour bus through the 4th checkpoint. Just taking sips of water, sucking on some oranges and the occasional sip of coca cola. The panic kicked in a bit that I would start feeling nauseous again causing me to stop and lose the 12hr finish, so I decided to push on by myself and tried to stay a couple of minutes in front of the 12hr group. And so I ran through the 5th, 6th and 7th checkpoints, all on schedule and keeping a pretty consistent pace. I continued to take S-caps every hour, continued with my water régime, occasionally pouring a sachet over my head to keep me cool. My 10-minute walk, 1-minute run plan had gone out of the window so I ran a lamppost, walked a lamppost, ran to a sign, walked to the next sign. I ate a couple of small salted potatoes on the way but still, my food intake was minimal. I was very aware I would probably hit a brick wall at some point due to the fact I wasn’t eating .… but the brick wall never came. All the hamstring and ITB issues I had had during training were none existent. Much to my surprise, my legs felt pretty good (don’t get me wrong they felt tired and sore after 15km but didn’t seem to get any worse than that!). The only thing that was sore was the top of my left foot, which was very painful when running downhill and I had to stop twice to loosen my shoe. I tried to ignore the pain and just pushed on. The atmosphere was incredible, so much support all the way along the 90km route. People cheering myself and Rand Athletic Club along. There was a group of women singing Shosholoza (a Zulu tribe song) and I cried, knowing that the last time I heard it was at the start and I had now run about 80km. Each km felt like they were so far apart, but I kept my head down and pushed on. I saw my support crew again and they cheered me on yelling at me to catch up with the 11hr 45min group. I seemed to keep gaining energy and so I slowly caught up with them with 8km to go. The longest 8km of my life. The next minute someone shouted at me to look to the left and there it was, Moses Mabhida Stadium in Durban, the finish. Cue more crying from me. I pushed on a bit more, running most of the last 8km and passing a lot of people walking which was a huge boost. With 3km to go, I realised even if I walked I could still make it. But I didn’t want to walk mainly because I’m stubborn. I chatted to a guy on the last few Km’s and he told me to make sure I take in every moment of this last section. And so I waved to the crowd and the RAC support crew. I turned left into the stadium, lights blinding and I heard the roar of the packed stadium. 200m to go and taking in the whole atmosphere. I crossed the finish line at 11hrs 38mins with my fists pumping in the air. I received my medal, and then the waterworks started. I sobbed and sobbed and sobbed, 9 months of hard training paid off. I still had no idea how the rest of my family were doing or whether they would finish in time. I later found out my family had all finished together at 11hrs 53mins and I couldn’t be happier that we had all finished. After collecting my medal I came back into the stadium and watched the 12-hour countdown. It is honestly brutal. One man fell to the floor a few metres from the finish line, and the whole stadium shouted at him to ​‘CRAWL, CRAWL, CRAWL’ and so he did making it just before the 12 hr cut off. Another man saw a woman struggling and ran back to help her with a few metres to go. As a result, he missed the 12hr cut-off, the gun went off, the marshalls ran on to block the finish line and Comrades was over. The look of despair on peoples faces who missed out by a few metres. Sacrificing your race to help a stranger is the ultimate sign of the Comrades comradery. I reunited with my family with lots of cheers and hugs, and then the DOMS pain really kicked in!! The quads pain was horrific, from all the eccentric load from running downhill and not something I had experienced in training at all. The most pain I have EVER been in. Walking down the stairs backwards after disembarking the plane the next day was a low point. My mum even got asked if she needed a wheelchair. My foot was hugely swollen and bruised and my quads felt like they were tearing. It took about 10 days for me to walk normally and fully crouch down. As they say, pain is temporary, completing a Comrades last forever! I spoke to another runner pre-comrades who told me Comrades was the most emotional thing. That your body will do things you didn’t know it could do. That no one will understand what you have been through unless they have done Comrades themselves. And when I finished I realised it was all true. Would I do it again…no, am I glad I did it… without a doubt. The most amazing and emotional experience. Now on to the next challenge. If you’re thinking of running a marathon, or even an ultra-marathon speak to one of our team to see how we can support your challenge. Book an appointment here. Read more about Lisa’s journey in her here.